Magic and technology colliding… that’s what we’re talking about here. An untamed wild where anything can be done and the only person stopping you from living your dreams is you. Take that smoke wagon from its holster and fire again and again on your orcish enemies. Dodge dragon fire while riding on horseback. I mean, that’s what being in the Weird West is all about! Kickstarter campaign ends on Friday, September 29, 2017, at 1:59 AM EDT. This Kickstarter is for the full version of the game, but they did put a free Basic version and a Quickstart adventure to “try before you back”. In addition, there are also a handful of videos to help walk through some of the basics. Reading through those Quickstart Rules, the big idea here is that there aren’t any dice, but instead it uses a deck of 52 cards to help define your character. But more than that, it appears to combine some aspects of collectible card games in that “The Deck is Your Stamina”. As such, it appears that as you make your way through the day there is a tangible and very visual way to determine not only your health but the potential strength of a character through simple current deck sizing. The free adventure, Triumph at Saint Kiaro is worth checking out as well. Not only does it provide some visuals as far as how the decks are laid out, but there are premade characters to let you jump right into things. 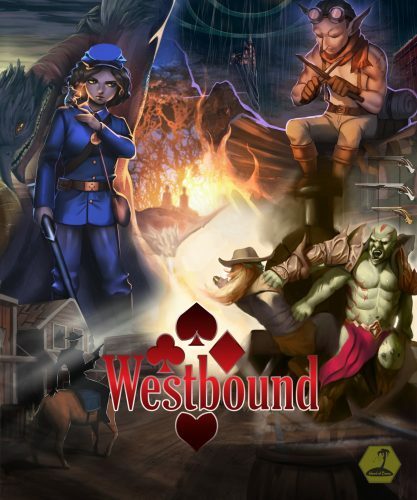 Westbound is definitely a game that falls more within the Weird West genre than all the way in the Steampunk one, but, as with many things, I believe those aspects play off of each other fairly well. I love the fact that not only is there a Quickstart Guide available, but there is also a scenario to play through so you can really take the game out for a test spin. One interesting idea with using a deck of cards as both your stamina and how you do checks is that as you proceed through the day, it might make sense not to take a rest if you have a bunch of higher value cards left in the deck (you wouldn’t want those lower tier cards suddenly showing back up in the deck). While there is some level of randomization even with what can get shuffled back into the deck, this creates a different sort of strain on your character – something not really available in dice games. This is one of those games I’d like to play in person. The decks of cards make good reminders, plus I can see where if you were to do a campaign, you might have a specific “special” deck for each one (character accessories are always fun). Some of the stretch goals seem to lend themselves to this very idea. For more information on Westbound: Revolvers and Rituals check them out here. Tagged diceless system, Island of Bees, John McGuire, Kickstarter, Steampunk, Steampunk Fridays, Westbound.